What are the best water filter and purification treatment systems used by backpackers? We asked backpackers whether they preferred squeeze-style water filters, pump water filters, gravity filter systems, chemical purification or purification using an ultraviolet light. We surveyed 1275 hikers in 2019 to ask them what water filters and treat methods they prefer. We found that 80% of them use just 10 different makes and models, which we list below, together with their average satisfaction ratings on a scale of 1-5, with 5 being the most favorable. Why does it matter what water filters and purifier methods other backpackers use? Your hiking peers have very similar needs as you. That doesn’t mean that you have to use the same water filters as everyone else, but it gives you a good place to start looking if you’re thinking about buying a new water filter or trying out chemical or ultraviolet water purification. So, don’t just take our word for it. Here are the 10 best backpacking water filters and water purification systems recommended by other hikers and backpackers in 2019. The Sawyer Squeeze Water Filter System includes the Sawyer Squeeze Filter, two 32 fl. oz. pouches, a cleaning coupling and additional accessories for gravity and inline use. Like the Sawyer Mini, you can drink directly from the Sawyer Squeeze but most people squeeze untreated water through it from a soft bottle to a clean container. The filter uses a hollow-fiber membrane filter that removes 99.99999% of all bacteria, such as salmonella, cholera and E.coli and removes 99.9999% of all protozoa, such as giardia and cryptosporidium. The filter itself weighs 3 ounces. Read the SectionHiker review. The Sawyer Mini Water Filter System includes a filter, a 16 oz. soft bottle, a drinking straw, and a plastic syringe to backflush the filter periodically. The Mini can be screwed on standard soda bottles, the included water pouch, or used with a straw to drink directly from a water source. It’s also easy to use to create an inline or gravity filter with hydration system tubing. The Mini removes 99.99999% of all bacteria, such as salmonella, cholera and E.coli, as well as, 99.9999% of all protozoa, such as giardia and cryptosporidium. The filter is made using hollow filter technology and rated to 0.1 micron absolute. It weighs 1.3 ounces. Read the SectionHiker review. The Katadyn BeFree Water Filter can be used as a squeeze filter or hung for group use as a gravity filter if you purchase the 3L version. It has a 0.1-micron microfilter that is EPA tested to remove protozoa (99.99%) and bacteria (99.9999%). It can filter water up to 2 liters per minute, which is very fast for this style of filter. An integrated widemouth soft bottle, available in three different sizes, 0.6L, 1 liter, and 3 liters, is easy to fill in streams and folds up compactly when not in use. Weighing 3.5 oz total, the filter alone has a life expectancy of 1000 liters. Read the SectionHiker review. Aquamira Water Treatment Drops use chlorine dioxide (used in municipal water treatment plants) to kill 99.9% of bacteria, viruses and cysts, including cryptosporidium and giardia. Each package of Aquamira contains two bottles, Part A and Part B, which you mix together before treating your water. The drops are effective in clear, muddy, warm and cold water and have a shelf life of five years, making them an excellent solution for international travel, hiking, backpacking, and emergency preparedness. Each Aquamira package contains enough drops to treat 30 gallons of water. Many people carry Aquamira as a backup in case their water filter breaks or for purifying several liters of water at once. Read the SectionHiker review. The Platypus Gravity Works water treatment system is a gravity filter that includes two x 4 liter water reservoirs, a water filter, and connecting hoses arranged in a gravity filter configuration. It’s ideal for filtering water for couples or families when you need to filter a large quantity of water quickly. The Gravity Works filter physically removes particles, protozoa and bacteria down to 0.2 microns in size, including giardia, salmonella, and cryptosporidium. Quick-disconnect valves and and a hose clamp make cleaning easy. 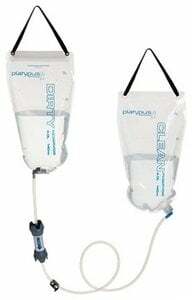 Filtration speed is over 1 liter per minute and requires no effort once the “dirty” bag is hung.The expected filter lifetime is 1500 liters of water. The entire system weighs 10.75 ounces and stows smaller than most 1L bottles. Read the SectionHiker review. The Katadyn Hiker Water Filter is a pump-based filter that removes particulates, protozoa and bacteria down to 0.2 microns in size, including giardia, salmonella, and cryptosporidium. It includes a pre-filter at the hose outlet that filters to 150 microns, good for use with cloudy or sediment-filled water, which removes large contaminants before they reach the main filter and increase its life span. Quick-connect fittings permit removal of input and output hoses: the hoses also connect directly to hydration reservoirs with 0.25 in. drink tubes. The expected filter life is 1150 liters before replacement is required. The Hiker weighs 11 ounces. The Steripen Ultra is a water purifier that uses ultraviolet light to neutralize bacteria, protozoa, and viruses that can make you ill. The Ultra is USB rechargeable and fits in narrow or wide necked bottles. It’s also one of the best solutions for purifying cold water, which will create tiny holes in most filters if it freezes when the filter element is damp in cold weather, thereby destroying them. To use it, you simply dip it in a container of water and stir, until an indicator lamp signals that the water is purified, after about a 90 seconds. 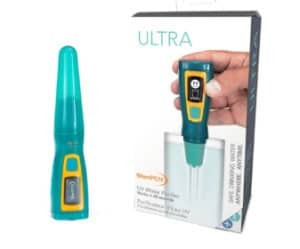 Weighing just 4.94 ounces, the Steripen Ultra has a UV lamp life of 8000 uses. The MSR TrailShot is a handheld pump water filter that you squeeze with one hand to draw water up through the hose and through the filter. Clean water comes out the other end, much like a water fountain, although you can also capture it in a water bottle for future use. While the primary filter is a hollow fiber style filter, limited to bacteria and protozoa removal, the TrailShot also has a pre-filter at the end of the hose to remove particulates and organic matter. The Trailshot is best used as a single person filter for processing smaller quantities of water, because squeezing the pump is tiring for any length of time. It’s ideal for people like runners who don’t want to be burdened by carrying water bottles. Read the SectionHiker review. The MSR Miniworks EX is a pump style water filter that screws onto wide-mouth Nalgene bottles and soft canteens. While the MiniWorks is heavier than simpler squeeze-style water filters, it’s a better solution for filtering turbid, cloudy, or tannic water sources like snow melt, spring thaw, or algae-infested ponds and turning them into clear and pleasant tasting water. That’s because the Miniworks is a three stage filter, with a pre-filter that removes larger solids, a ceramic filter to remove microorganisms, and by a charcoal filter to remove unpleasant odors and tastes. Weighing 17 ounces, the Miniworks has an output of 1 liter per minute and filters out contaminants down to 0.2 microns in size. The expected filter lifetime is 2000 gallons. Replacement filters are also available. Read the SectionHiker review. The Sawyer Micro Water Filter is virtually identical to the Sawyer Squeeze Water Filter, except that the filter weighs 2 ounces or 1 ounce less than its big brother. Being smaller, the flow rate is slightly slower, but still faster than the Sawyer Mini. The Micro filter is rated for 100,000 gallons and includes 32-ounce reusable squeeze pouch, drinking straw, cleaning coupling, spare gasket, and cleaning plunger. If you already own the larger Sawyer Squeeze, there’s no real reason to replace it with the Micro. Many natural water sources contain microscopic organisms that can cause illness in humans. Most water filters intended for backcountry use will remove bacteria and protozoa, including giardia and cryptosporidium from these water sources. This is usually sufficient in the United States, Canada, and the UK. Viruses, often found in international water sources, are hard to remove because they are so small. Finer grained filters called purifiers are needed to remove them. They also can be neutralized with chemical purification agents such as chlorine dioxide or ultraviolet light. There are a wide number of different water filter and purifier types available. Unfortunately, none of them are foolproof or perfectly suited for all kinds of trips and locales. They also differ in ease of use, the length of time it takes for them to process water, and whether they’re good for solo or group use. Here’s a brief summary of the different types and their strengths and weaknesses, with several examples to illustrate the available products in each category. How do we know what the top 10 best water filters and purification systems are? We survey our large readership to ask. If you’d like to participate in our surveys, be on the look up for the gear raffles we run every few weeks on SectionHiker, where we give survey participants a chance to win. Or sign up to the weekly, award-winning SectionHiker newsletter, so you never miss out on an opportunity to participate. We hate spam, so we’ll never share your email with anyone else and you can unsubscribe at any time. Check Out All of SectionHiker’s Gear Guides! The post 10 Best Backpacking Water Filters and Treatment Systems of 2019 appeared first on Section Hikers Backpacking Blog.